For royal jewel lovers, there are few things better than the sudden, suprise reappearance of a jewel that has been hidden away from public view for decades. One of the biggest of these surprises was the reemergence of one of the most impressive diadems belonging to the former royal family of Greece: the diamond tiara of Queen Sophie of the Hellenes. The first owner of this large, intricate diamond tiara was Queen Sophie, who was born Princess Sophie of Prussia. She was the daughter of Princess Vicky, the first child of Queen Victoria and Prince Albert, and the sister of Kaiser Wilhelm II. 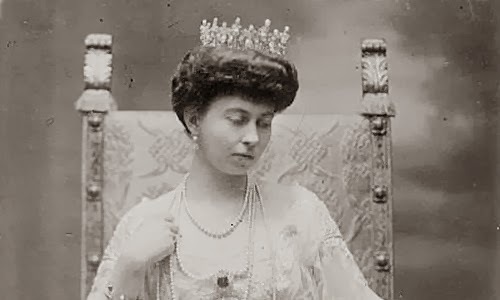 It's not ever been revealed exactly how Sophie acquired the tiara or who made the piece, but many have guessed that she received it from one of her many royal relatives (possibly her mother or her brother) as a wedding present. Sophie married Crown Prince Constantine, the future king of Greece, in 1889. The piece is an intriguing combination of modern and traditional styles. Many of the stones are large, rectangular diamonds. But those stones are nestled within more traditional floral designs, which are reminiscent of the ruby tiara owned by the Bernadottes and the sapphire tiara of Princess Elisabeth of Denmark. Sophie wore the tiara as a crown princess and as a queen. Sophie's daughter, Princess Helen (who married the crown prince of Romania and gave birth to the country's last king), was also photographed in the tiara; the portrait was taken by Bassano in 1934, two years after Sophie's death . 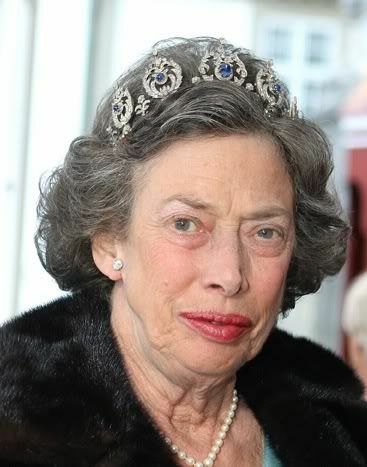 In 1938, the tiara was given to Sophie's daughter-in-law, Princess Friederike of Hanover, the daughter of the Duke and Duchess of Brunswick. Friederike wore the tiara on her wedding day (along with the small nuptial crown of Queen Charlotte of the United Kingdom, which had been won by the Hanoverians in a legal dispute with Queen Victoria). 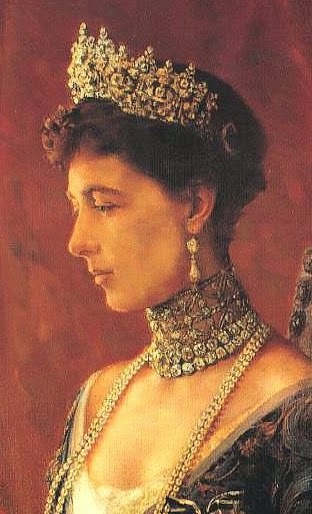 Friederike was the last Greek queen to wear the tiara in public. She did loan the piece once to another queen: Ingrid of Denmark, mother of Friederike's daughter-in-law, Queen Anne-Marie. 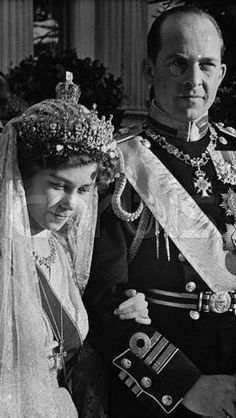 Ingrid borrowed the tiara during the centenary celebrations of the Greek royal family, an event that started with a state visit from Denmark. Here's a video that shows Ingrid wearing the tiara; she appears at about the 4:40 mark. After the Greek monarchy was deposed, the tiara vanished from public view for nearly half a century. Queen Friederike still owned the tiara when the family went into exile; although she gave other tiaras to Queen Anne-Marie, she kept this one in her own collection. Most jewel lovers assumed that the tiara had been sold either during the final years of Friederike's life or after her death in 1981. Even so, there were persistent rumors that the family still had the piece. Those rumors were substantiated in spectacular fashion in 2012, when Marie-Chantal, the wife of Crown Prince Pavlos, appeared in Queen Sophie's tiara at a banquet in honor of Queen Margrethe II of Denmark's ruby jubilee. The enormous tiara nearly overpowered the diminutive princess, but no matter -- the fact that the Greeks still had the piece was the main story of the evening. Why it hadn't been worn for so long -- and why Queen Anne-Marie of Greece has never worn it -- still remains a mystery. 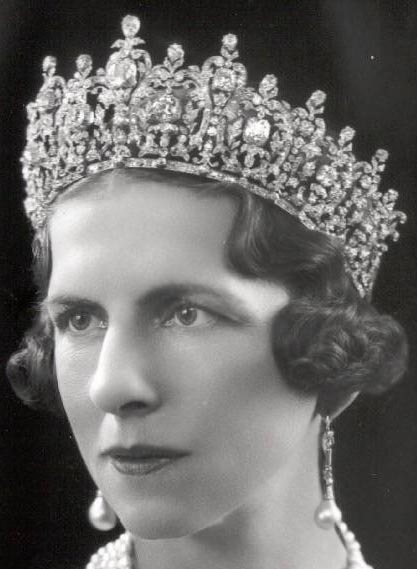 Some have speculated that Queen Friederike left the tiara directly to her grandson, Crown Prince Pavlos, just as Queen Ingrid of Denmark willed the ruby parure directly to Crown Prince Frederik. Others have wondered if the piece was inherited by someone else, possible Princess Irene, and was then subsequently acquired by the main branch of the family. Perhaps we'll never know. All I know is that I am amazed that this piece is still in royal hands and grateful that we get to see it sparkle again after so much time! 3. See the National Portrait Gallery website for another pose from the same sitting. 4. Detail from Georgios Jakobides's Portrait of Queen Sophia of Greece (1915); original here.